Craftin' Caro: Stampin' Extravaganza - Saturday June 23! Stampin' Extravaganza - Saturday June 23! The oh so amazing Christyne Richardson is hosting the next big fabulous stamping event that you will not want to miss: Stampin' Extravaganza! Plan to join her at the Royal Canadian Legion Branch 101 at 3850 Lakeshore Blvd. 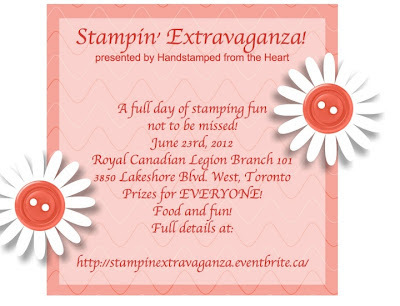 West in Etobicoke on Saturday June 23 for a day of fun, food and stamping. Centrally located, this venue will be easily accessible by GO Transit, TTC and Mississauga Transit. It is just seconds ON FOOT from the Long Branch GO Station and Long Branch Loop. Early bird pricing is available until May 31 and then prices go up, so be sure to get yours now! P.S. Had you preregistered at the last Palooza in October for our next big event? Contact me directly to either transfer your registration or request a refund!